A Rematch for the Georgia Senate: Will Obama Help? 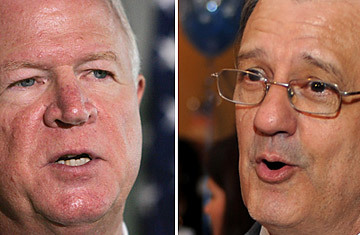 (L to R) Saxby Chambliss and Jim Martin. The campaigning isn't over in the state of Georgia. The two main candidates in a bruising U.S. Senate race there acknowledged they're headed for a runoff battle that could recycle weeks of the same stump speeches, party luminaries and withering attack ads that plagued the state in the period leading up to the vote. It is the election as Groundhog Day. Though 96% of voting precincts had reported, several thousand votes had yet to be counted, campaign officials said, many of them coming from absentee ballots, provisional ballots and military voters. While both sides expressed confidence, that the outstanding ballots would turn their way, they acknowledged they'd remain in campaign mode until a winner is announced. However, if there's no clear-cut winner from this round of voting, a situation some local experts expect, Georgia voters will head back to the polls on December 2, in a race that could help inch the Democrats closer to a supermajority in the Senate. "In the next few weeks, Georgia will be the center of the electoral universe," says Charles S. Bullock, a political science professor at University of Georgia. "I see national Democrats and Republicans focusing their efforts here and pouring money into the state for this runoff. I'd expect we'd see Barack Obama here and John McCain too." Bullock also expects the return of hard-hitting political attack ads that have characterized both sides. When Chambliss first ran for the seat in 2002 against the incumbent Max Cleland, he aired ads that accused Cleland, a triple amputee and decorated Vietnam veteran, of not being patriotic enough and soft on Osama Bin Laden. Fast forward six years and the attacks have been just as ugly. One of Chambliss's charges is that Martin raised taxes as he voted to raise his own government expense account. Martin fired back with an ad saying Chambliss had "supported George Bush's economic policies every step of the way." "Voters will probably groan with another four weeks of this," Bullock says. "And to some extent they won't go back to the polls. That's going to be the real first test for Obama, to see whether he can mobilize voters when he is not on the ballot. After all, he will have to do the same thing in 2010 to be sure he can hold onto and expand Democratic seats in the House and Senate. We know there's an Obama effect when he's on the ballot, but when he's not, is it transferable?" Martin, in a conference call with reporters, seemed to believe the answer was "yes" and had said he had already placed a call to the President-elect asking for his support. Chambliss, in another press conference later in the day, seemed to believe the answer was "no," but acknowledged the national implications of the race. He said a runoff could force him to face the flood of Democratic money that bedeviled John McCain in the presidential race. "Look, a runoff is just not good news for Saxby Chambliss," says Merle Black, a political science professor at Emory University. "He's been in office for six years and he just didn't have enough strength to get a majority of the votes."